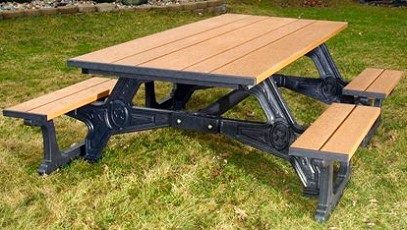 The Recycled Plastic Versailles 8' Picnic Table offers the appearance of intricate cast iron legs with the maintenance free attributes of recycled plastic lumber. This picnic table provides old world charm with commercial grade durability. Table Top Width: 40 1/2"
Additional freight charges will may apply on this item. We will contact you with these additional charges, and await your approval before finalizing your order. Please email or call for a freight quotation. Be sure to specify what you wish to order, and indicate your zip code when requesting a freight quotation. Please allow up to one business day for us to finalize your freight quotation. Our email address is sales@abundantearth.com and our toll-free telephone number is 1-888-513-2784.